The global battery materials Market is expected to display stiff competition among leading players such as Arkema SA, BASF SE, FMC Corporation, Cabot Corporation, and Mitsubishi Chemical Holdings Corporation. Players within the market are concentrating on manufacturing batteries that are efficient but at low cost. According to Transparency Market Research (TMR), players are also focusing on a developing high performance capacity batteries stiff competition and increasing their consumer base. According to Transparency Market Research, between 2017 and 2025 the global battery materials Market will exhibit a remarkable growth of 13.6% CAGR and rice to US$13.7 bn by 2025. On the basis of geography, North America has been leading in the market for a battery materials on account of the presence of a large number of car producers. 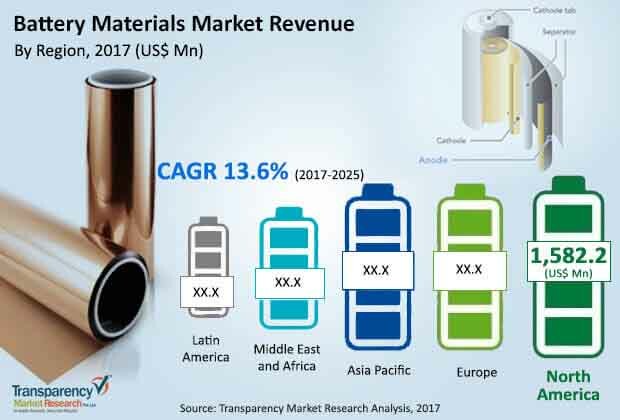 However, asia-pacific is expected to rip North America or if its leading position within the battery materials market by expanding at a robust CAGR of 12.2% and becoming the largest regional market for battery materials. On the basis of application, it is expected that the secondary batteries segment will lead on account of high demand for secondary batteries such as lead acid, lithium iron, and nickel metal hydride from the automotive and consumer goods sector. Since consumer is expanding across the globe, a similar growth will be observed by the secondary batteries segment. On the basis of types of battery material, it is expected that the cathode battery material will be most in demand. Electrolytes and anode are expected to be other key materials of battery which will be in demand. On the basis of end use, consumer goods is expected to be the leading segment. With a staggering surge in the rise of the sales of laptops computers, and mobiles, there is a height in the demand for various types of battery materials and this will bolster the growth of the market. In addition to this it is expected that the transportation sector will also be a lucrative and use application area for battery materials. Within the transportation sector, battery materials are used for Aerospace, Marine, automotive, and locomotive transportation. Moreover, with the growing concerns regarding Environmental Conservation and reducing carbon footprint, and reduction of harmful emissions, the uptake of electric vehicles is expected to increase worldwide. This in turn is expected to bode well for the battery materials market and also drive the transportation sector as a key end use area. According to the lead author of this report, with natural sources of fuels falling increasingly short, there is a need for Effective alternatives and this trend is expected to give rise to electric cars and other battery-driven vehicles which require the use of batteries. This in turn is subsequently benefiting the battery materials Market. With recent technological advancements and Innovations, the manufacturing of lithium ion batteries have become extremely cheap. This in turn is expected to further drive the growth of the battery materials market. Within the consumer goods and Automotive sector, there is an increasing and keen interest among manufacturers for Effective energy storage solutions and this will also bode well for the growth of the battery materials Market. With a large number of countries voting to reduce carbon footprint by replacing conventional vehicles with non-polluting electric and hybrid vehicles, it is expected that the demand for battery materials will surge tremendously.